This Tactical Pen has a solid feel in hand with a ridged aluminum body for good grip. 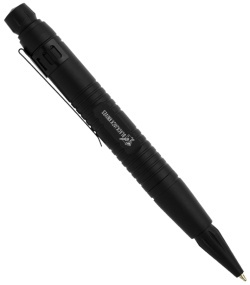 It has a twist retractable tip and replaceable black ink cartridge. The steel pocket clip is removable, but greatly adds to the utility of this self-defense implement.